With a mix of peoples from the indigenous Berbers to Roman, Arabic, and Turkish influence, Tunisian culture today is rich and diverse. The Zaouia of Sidi Saheb is a classic example of Tunisian Arabic architecture. The people living in the Republic of Tunisia, located in north-central Africa along the Mediterranean Sea, are known as Tunisian people. Their capital city is Tunis. They are mostly Arab, with a minority of the non-Arab indigenous Berber people. Tunisian Arabs are actually a combination of Andalusian peoples from across the Mediterranean, Arabs from neighboring North African nations, and Turkish descendants from the Ottoman period, though most of these collective peoples consider themselves simply as Arabs. Berbers lived in North Africa prior to the entry of Arabs, and have an illustrious culture that dates back to more than 4,000 years ago. Over the course of Tunisian history, people and customs from other civilizations, including those of the Phoenicians, Romans, Arabs, and French, have become absorbed into Tunisian culture. Arabic is the official language. Other languages spoken by these people include English, French, Italian, various local dialects, and German. 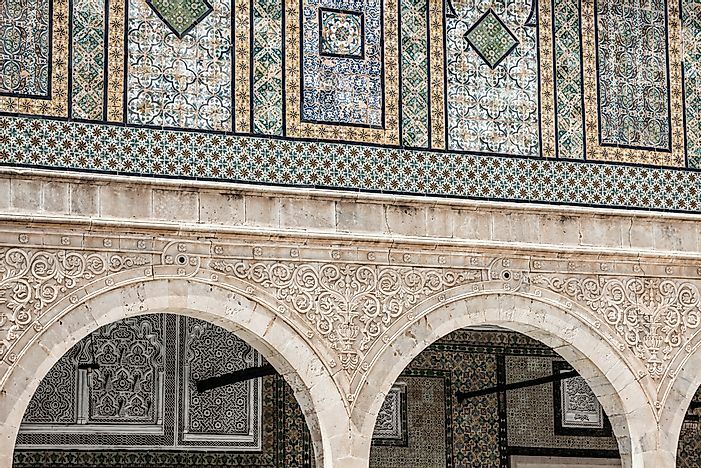 Tunisian architecture boasts of many distinct styles from different eras. Among these, one of the most prominent remains to be the ancient Berber architecture, which boast of troglodyte pit houses and fortified granaries. The other prominent architecture styles are those from the Punic and the Roman cultures. However, wide streets and public parks became common in the French colonial era. St. Vincent de Paul Cathedral, located in the city of Tunis, is one of the most brilliant examples of the French architectural influence in Tunisia. There is also a heavy influence of Islamic and Arabic architecture, which becomes evident in the minarets, mosques, and Zaouias scattered throughout the country. Tunisian cuisine is generally spicier than that of most of the rest of North African cuisine. Grain-based dishes such as couscous and asida are staples of the Tunisian diet, often served alongside pulse-based dishes, such as chickpea lablabi. Some of the most important flavoring ingredients of this cuisine are harissa (i.e. a kind of hot pepper sauce), tomatoes, olive oil, garlic, cumin, and eggs. Since Tunisian people live near the sea, fish and seafood have traditionally been eaten as well. Fruits, nuts, herbs and meat (especially lamb) are also key features of the Tunisian cuisine. The cuisine, however, varies from north to south. Some of the typical dishes of the cuisine are brik, tajin, shorba, kifta, baklawa and samsa. The culture of the Tunisian people is an electric mix of different cultures, which makes it diverse and unique. Anouar Brahem, Raoul Journo, and Nabiha Karaouli are some of the most notable names of Tunisian musicians who have contributed in the field of music. In literature, the contribution of Mahmoud Messadi has been remarkable. Some of the other reputed names are Najoua Ben Othmane in the field of painting and the competitive swimmer Oussama Mellouli in the world of sports. Tunisian culture is under tremendous threat due to internal and external forces alike. The threat of international terrorism is eroding the tourism industry, a trend which, if it continues, will affect the Tunisian economy in a very negative manner. With a mix of diverse cultures, Tunisia has been a favorite tourist destination. With ISIS eying Tunisia to make it part of a radical Islamic Caliphate state, it is becoming increasingly challenging for the Tunisian people to maintain and preserve their cultural identity. As theirs is not a dominant world culture, every aspect of it is at stake. The uniqueness of the Tunisian culture lies in its diversity, and an imposed radical Islamic culture on the grounds of terror will do much harm in the long run. Though most Tunisians are already Muslim, they are peaceful, civil, and respectful of others, which groups such as ISIS certainly are not. Furthermore, like much of the African continent, a population explosion in the last half-century has placed a strain on Tunisia's resources and infrastructure.